On 1st January 2016 I committed to carry out a Random Act of Kindness every day for a year. This was an experiment initially to explore kindness and also whether it would provide an antidote to judgement, something I fear is increasing in our society. I learned many things during the 366 days that passed – far more than I could ever have hoped, including what kindness really meant to me. 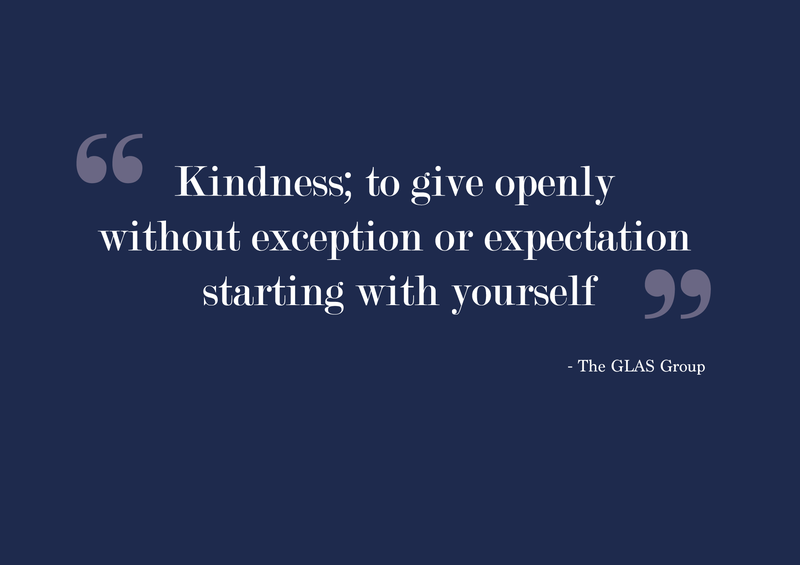 This led to me deciding that kindness was such a valuable thing to focus on, especially in combatting judgement, that I have continued each day since. I’d also discovered the power of kindness in terms of mental health, well-being and connecting to those near and far. On the 100th day of 2016 I decided to write 100 notes to friends, family and colleagues with one thing I most admired about them. I didn’t necessarily have a deep relationship with all of the 100, and in some cases I didn’t see or even like so of the people on the list that much, but finding one thing to acknowledge about them was just incredible and impactful. I had no idea that people might reply back to me but they did, in their droves. People shared with me how they were struggling and the note was exactly what was needed, that they felt moved, were so pleased to know someone saw or heard them etc. I have never carried out an act of kindness to receive thanks or recognition and so this was astounding to me. In 2017, again on the 100th day of the year, I did a similar thing. This time I focused on my professional network – customers, suppliers, colleagues and so on, again sharing with them someone I really admired about them. The same reponse followed. Amazing, especially as I didn’t even know some of the recipients that well. Fast forward to this week, and my 100th day of inspiring kindness for 2018, and 831st act of kindness overall. I’d just returned from a family ski trip and was shattered. As I woke and thought about the day ahead and it being the 100th day I wondered about options and if I could get away with printing 100 nice quotes and leaving them in assorted places for strangers – after all, it would be far easier and quicker than 4-6 hours of sending personal notes! But I just couldn’t bring myself to do that. I absolutely felt that I needed to rally myself knowing the impact that kindness can have on everyone, me included. First things first, I needed to create a list of 100 people and then and get typing. But not wanting to repeat the same exercise I thought about alternatives for both my list of 100 and the context of the notes. I have come to believe that it’s just as important to see kindness around us as it is to be kind. And so I thought that my list of 100 people should possibly be those that have shown kindness to me and / or others so that I could acknowledge this and thank them. After an hour of creating a list of one hundred names, I started typing my first note to Jo at 3.42pm and finished with Will’s at 7.30pm. Amidst this, emails, messages and notes were coming back to me faster than I could type and send. Many people sharing that they’d be reduced to tears on reading their personal note. All were deeply touched and appreciative of someone just seeing their kindness. On reflection I realised that out of 100 notes, all were thank you’s for differing types of kindness but non were thank you’s for material possessions. I’d thanked Steve for his challenging and support, I thanked Graham for hugs and care. From Jennette it was the help given to not just me but my whole family, from Helen it was the kindness shown on my first day at high school and Emmy is was the ability to love and care for everyone around her. I am still receiving notes back – all have touched me deeply and shown me just how much kindness really does exist around me and how grateful I am. I could have easily written a list of 200 or even 300 + names. Later this year will see my thousandth day of kindness. I have no idea how many people I may have touched or been kind to by that point, but I do know each one has shared with me the true magical touch of kindness. I am constantly amazed and humbled at the power of kindness – I hope this helps to inspire you to be a little kinder, to yourself and others, and to see more kindness in the world. Watch this space to see what I will do on the 1000th day!